This phone is solidity in meat. It seems and one feels very prestigious. You understand immediately that this one is a true something not hardly a little of trinket of China. The dimensions of the telephone are 107x45x16.5 millimeter, load 134 grams. Some suppose that Nokia 8800 is a connection between the Nokia telephones 8910/8910i of the image and the line of Vertu for 8800 Nokia and identical steel black of Vertu. From left to right: Nokia 8800 from steel, Nokia 8910i from alloy containing titanium, Mobiado Professional from anodized aluminium, Vertu Black Leather from steel. The history of the sliding metalists of Nokia includes more than a generation. The first one of them, Nokia 8810, appeared when it was not the notion of the “sliding one” so still raised. Its descendant - Nokia 8800 - maintains the best characteristics of the class. It includes the style of Nokia and (as far as the model of the image) the operation and the long-range charisma of the telephone of the businessman guessed right. To open the phone one needs to set a thumb against a special relief spot with a pattern consisting of shallow apertures for the thumb not to slide off. 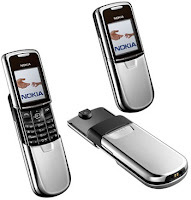 In Nokia 8800 the sliding part includes both display and the keypad. A curious reader may object that we saw such construction in Nokia 8910/8910i. In the models mentioned above the hand holds only case while the phone itself “shoots out” of it. In Nokia 8800 the fixed part is not a mere case it contains an in built main phone chip plus battery plus other essential parts. The phone is equipped with semi-automatic mechanism. Unlike Nokia 8910/8910i where user has to press two side buttons to make the telephone “shoot out” on its own in Nokia 8800 user is to drive the sliding part half way and the rest of the trip it'll do on its own due to a special spring. On the other hand the reverse process is also semi-automatic while Nokia 8910/8910i is to be closed manually which sometimes takes pains – at least it is difficult (if possible at all) to fulfil such operation with the help of only one hand for the spring is to be led up for the next “shot”. Disappointing of the small piece was the fact that there is no sounds while opening or closing the slider. Most of sliding modern are able to emit various kinds of warbles while being either opened or closed. Nevertheless this action in Nokia 8800 is accompanied with a so expressive natural sound that the artificial effects could look like redundantes in the present situation. As usual phone opening/closing corresponds to receiving/ending the call. One of the problems of all image phones with smooth mirror-like surfaces is fingerprints left on it. Nokia 8800 is not an exception.